Work from 2014 including exhibited. Islington Arts Factory November 2016.
left to right: Marks: Canvas, cardboard, gesso, pencil, poster paint. 170 x 124 cms. 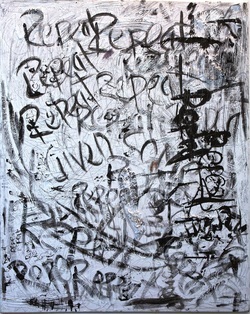 Marks:Board, paper, crayon, pencil, biro. 180 x 155cms. Suspended: Tissue, wire, pva, thread, wool, debris, acrylic cubes, 96 cms. Left to right. Box: Tissue, wire, pva, thread, acrylic cube. 25 cms. Suspended:Tissue, wire, pva, thread, debris, acrylic cubes, 96 cms.Lying Down: Tissue, pva, plaster, debris, ammunition box. 85 x 60 x 45 cms. Tissue, wire, pva, threads, debris. ​Each torso 70 x 44 x 24 cms approx. Sitting Figure. Latex, tissue, pva, wire & debris. 110 x 80 x 80 cms approx. 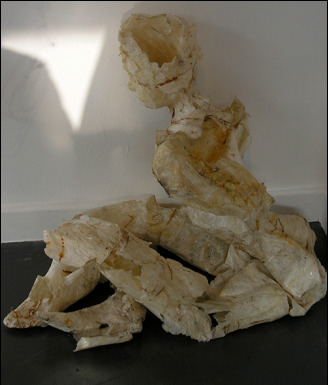 Torso Sculpture.Tissue, PVA, Wire, Various debris, Jacket: Sculpture 66 x 35 x 25 cms approx. 2 part Acrylic Cubes 66 & 30cms. ​Suspended Sculpture & Group.. Tissue, wire, pva, thread, various debris, paint, miniature pram and dolls. 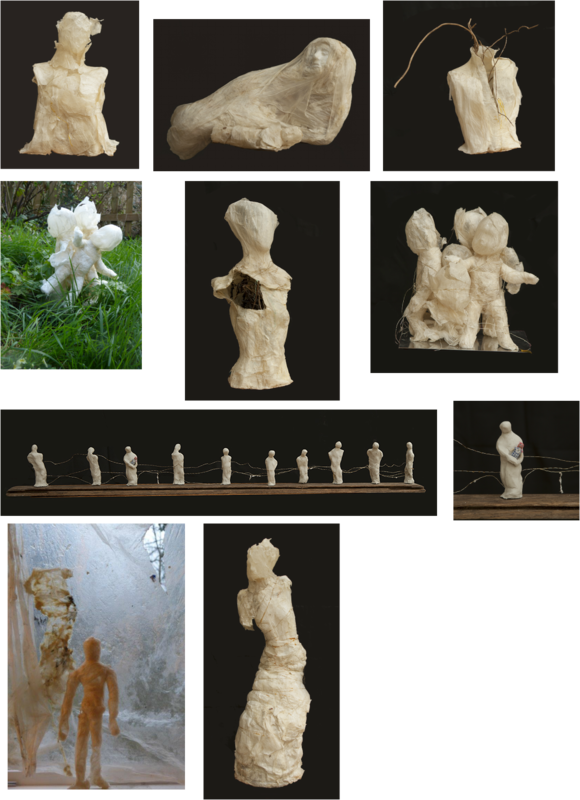 Sculptures 20 x 8 x 2 cms approx. 2 part Acrylic Cubes 66 and 30 cms. 2014-17. 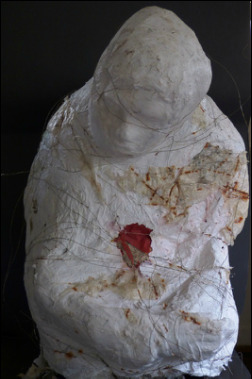 Materials include: PVA, Tissue, Plaster, Latex, Wire, Twigs, Debris, Threads, Plaster. Various Sizes.